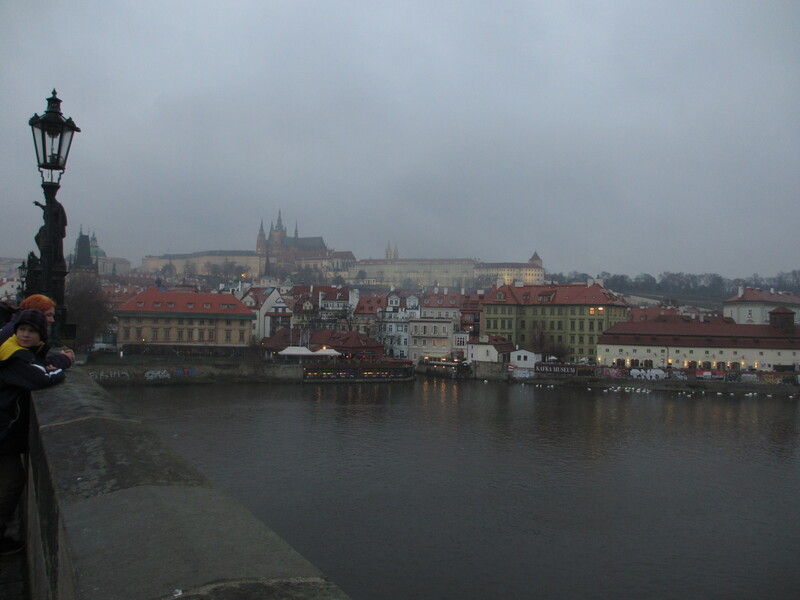 This past weekend I jumped on a plane and travelled to Prague with a couple other students from my program. 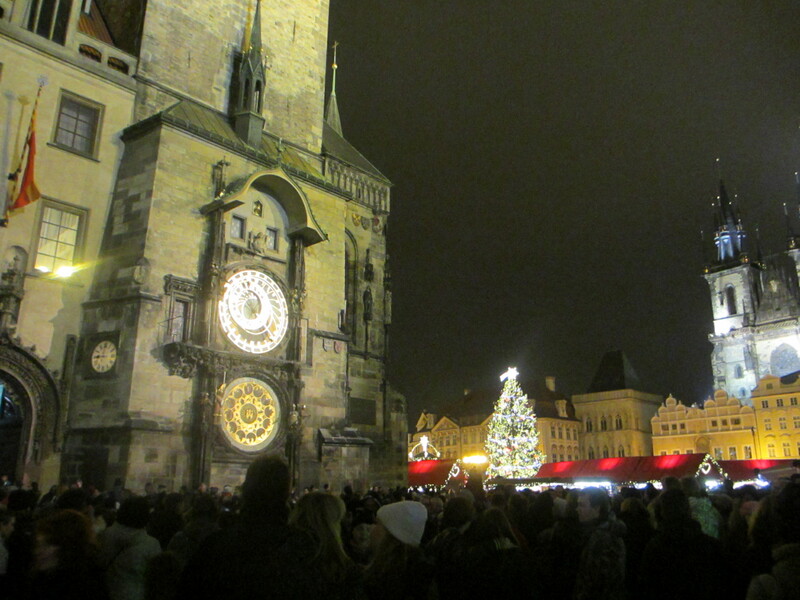 During the month of December, Prague has their celebrated Christmas markets and I was lucky enough to find a hostel just off of Old Town Square. We arrived at night time, checked into our hostel, and then headed out to find dinner. But not before stopping for a few pictures in Old Town Square. 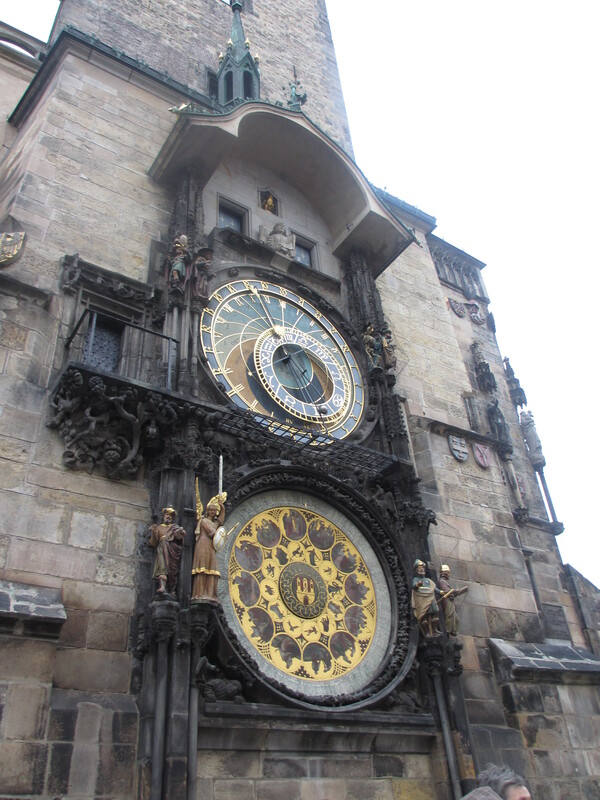 On the left is the Astronomical Clock and on the right is the Church of Our Lady Before Tyn. 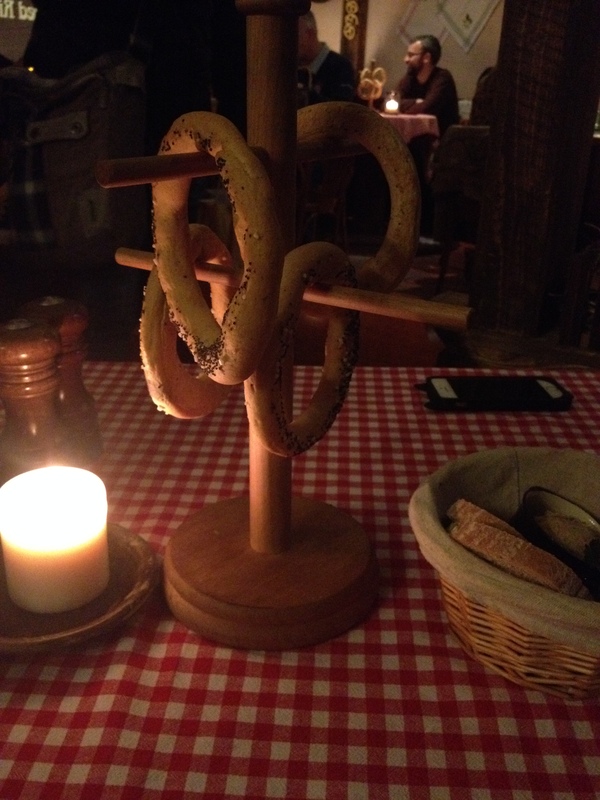 They were pretzels… I think, but no one else at the other tables touched them. Also we weren’t entirely sure how long they’d been there. 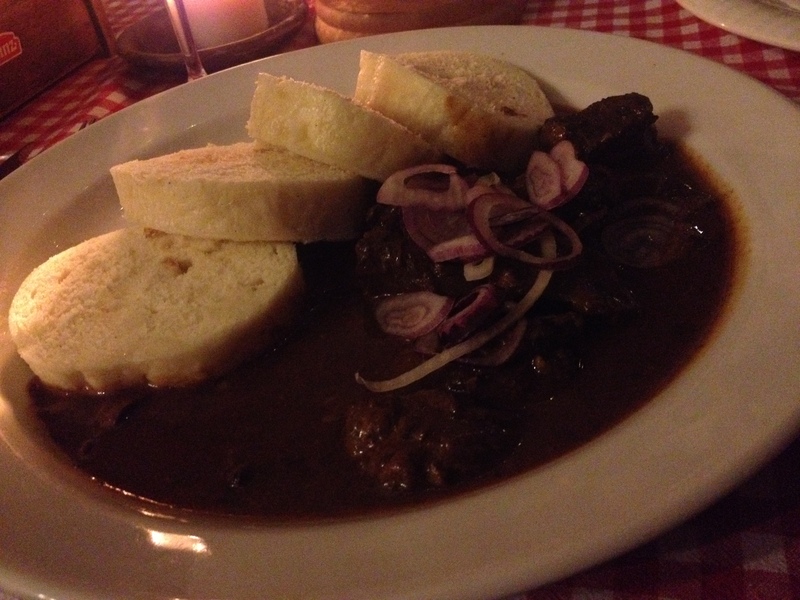 They had a list of Czech specialties on the menu so I decided to try goulash with bread dumplings. It was really good, but I have to admit the “dumplings” were a little odd. Czech dumplings are like extremely dense and chewy pieces of bread. Ideal for soaking up goulash soup, but very heavy. Unfortunately Czechs don’t label their menus very well and I was too stupid to ask if the apple strudel we had for dessert contained nuts so I spent the night throwing up. The next morning was beautiful though and we planned to meet up with our other friends in front of the Astronomical Clock and then take the free tour that our hostel offered. 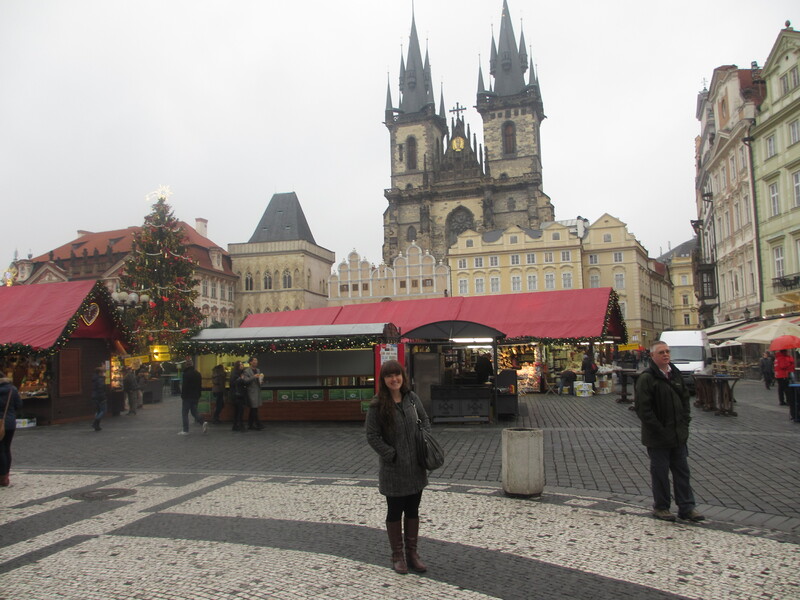 Me in front of the Christmas Markets and Our Lady Before Tyn. Yeah I’m going on the tour. Bye! And then we walked through the Jewish Quarter and everything on that side of the river. I was unfortunately too distracted by my guide’s excellent storytelling (and his attractive face) to take many pictures. Defenestration is now my favorite word in the English dictionary. It means to throw someone out of a window and apparently the act is quite addictive for the Czechs and Bohemians. Part of the reason I’m so interested in the history of Prague is due to A Discovery of Witches and the series by Deborah Harkness. It’s quite possibly my favorite series ever. In the second book the main character travels back in time to Elizabethan England and she ends up spending quite a bit of time in the court of Rudolf II in Prague. Basically, he was the slightly crazy Holy Roman Emperor with a penchant for collecting oddities, especially one related to the occult. His lifelong quest was apparently to find the Philosopher’s Stone and thus caused the science of alchemy to flourish in the city. So I was understandably quite upset to learn that the Swedes sacked Prague in 1648, stealing all of Rudolf II’s collections where they remain to this day in Stockholm. I guess I’ll just have to plan a trip to Stockholm now because the Codex Gigas (Devil Bible) is just too creepy to miss! After the tour was over I went to lunch with two friends I had met on the tour and by this point I was definitely thinking that solo travel might not be so bad. Free tours and hostels really give you the opportunity to meet like minded people and since you’re travelling on your own, you can do whatever you want to! 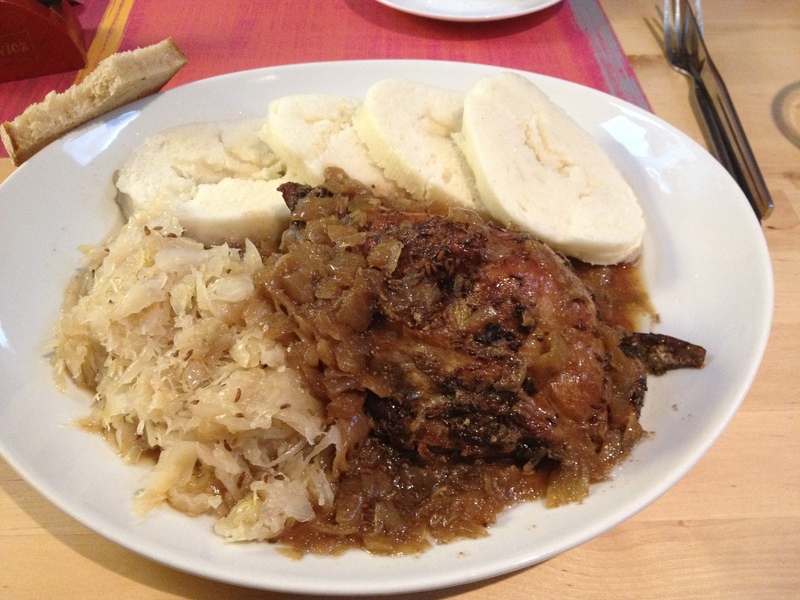 For lunch I ended up having another Czech specialty: roast duck, with more bread dumplings and a side of cabbage… possibly. I wasn’t quite sure. The duck and cabbage were fantastic, but I think I was only able to eat one of the dumplings because they were so heavy! It was kind of nasty weather all day, but that just meant that the city looked even more mysterious! 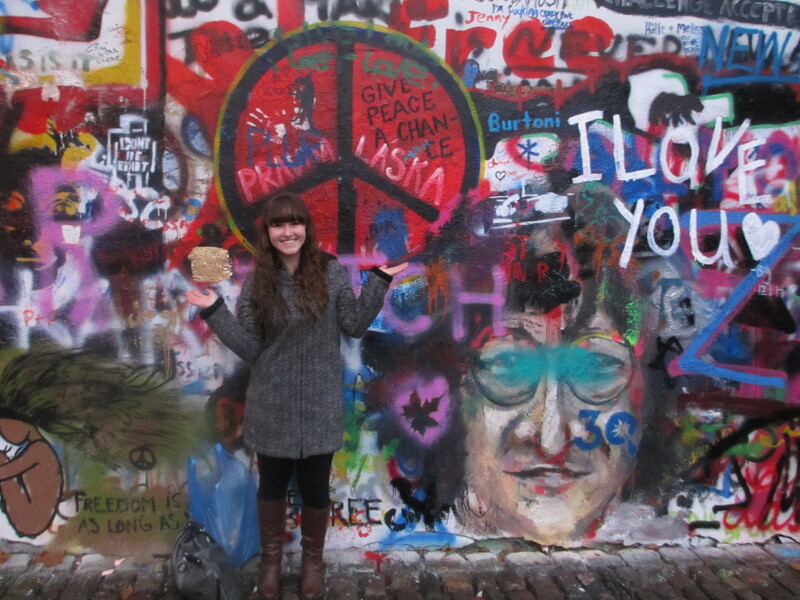 And we stopped to see the John Lennon wall, which was quite recently painted over all in white by some students in order to allow “new messages” from this generation to be painted. Then we headed back across the river in the direction of our hostel and we stumbled across a building in Old Town Square with the name DALI written in big letters. 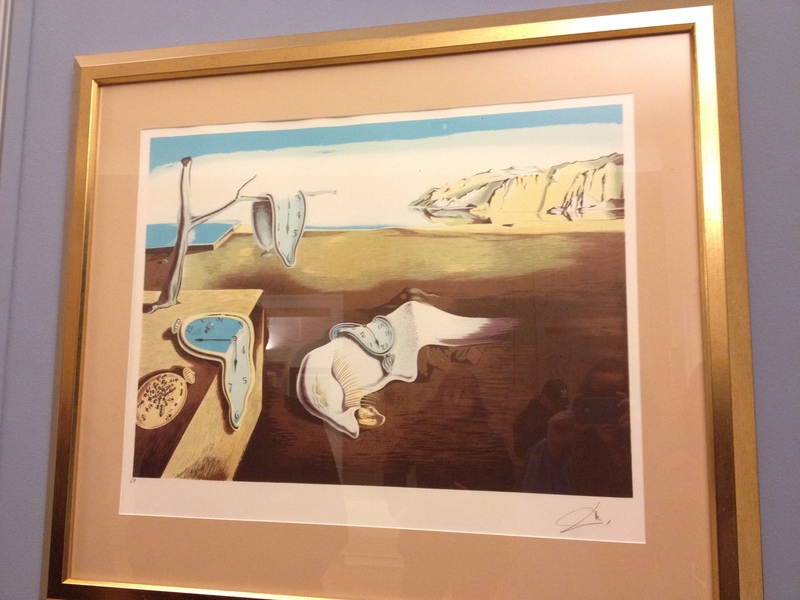 Turns out it was a museum dedicated to Salvador Dali, Alphonse Mucha, and Andy Warhol! The next day I decided to go off with my new friends (instead of the friends I came with) and I went on another guided tour by the same group, but this one was dedicated to the castle and the other side of the river. Lots of interesting stories followed as we meandered through the castle, a monastery, and the remnants of communist authority in Prague. 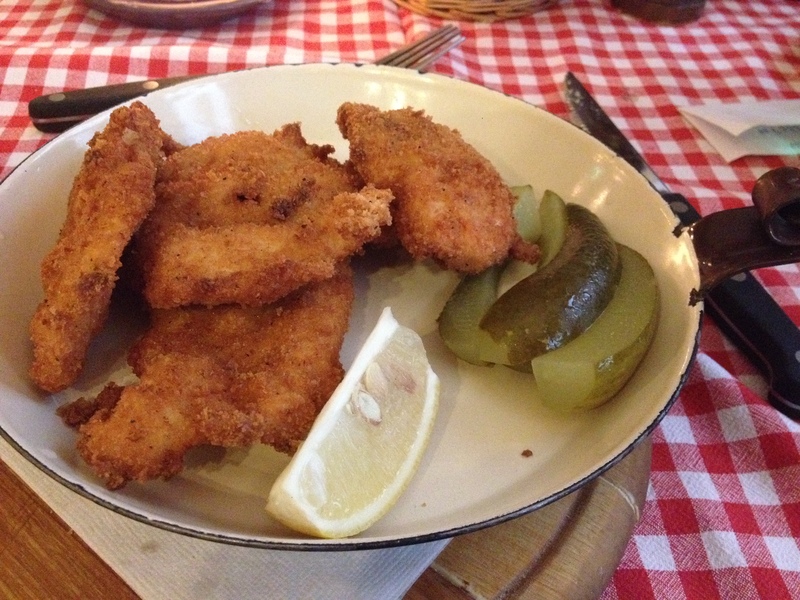 Then I went to lunch and had another Czech specialty: Chicken Schnitzel! It was fantastic. The Czechs really love meat. Then I saw potato dumplings on the menu and decided that I had to try them in place of the bread dumplings. I shouldn’t have done it. I think I was only able to eat one. 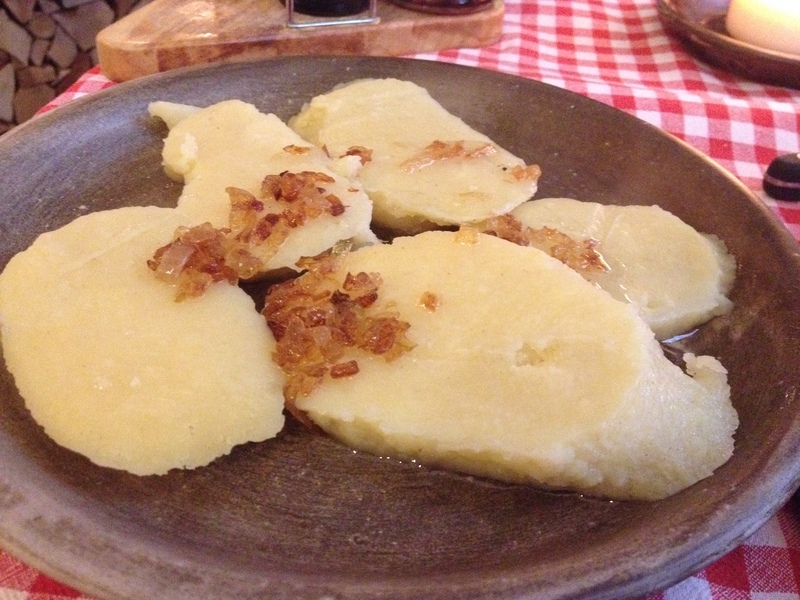 They tasted just like the bread dumplings: heavy, chewy, and dense, but they were made out of potatoes this time. 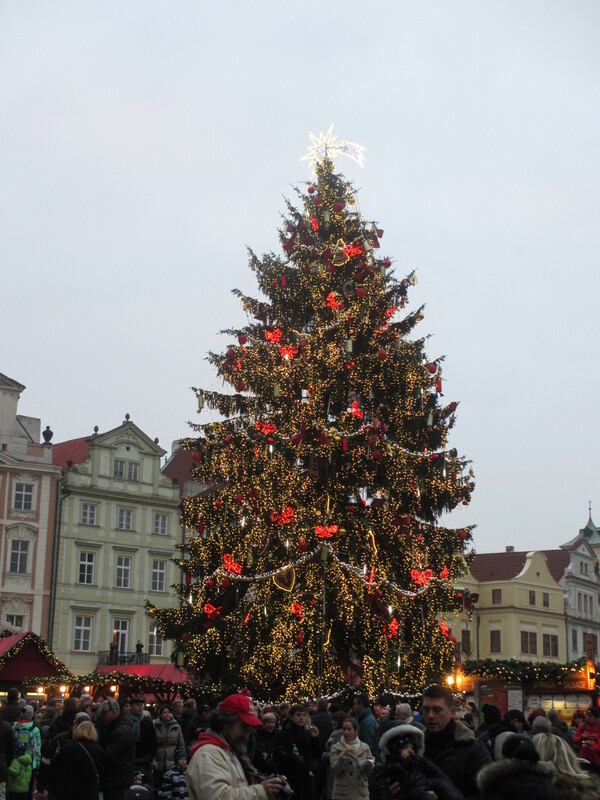 Then I spent the rest of my time in Prague just wandering around the Christmas Markets and the area around Old Town Square. Here’s a close up of the Christmas tree! 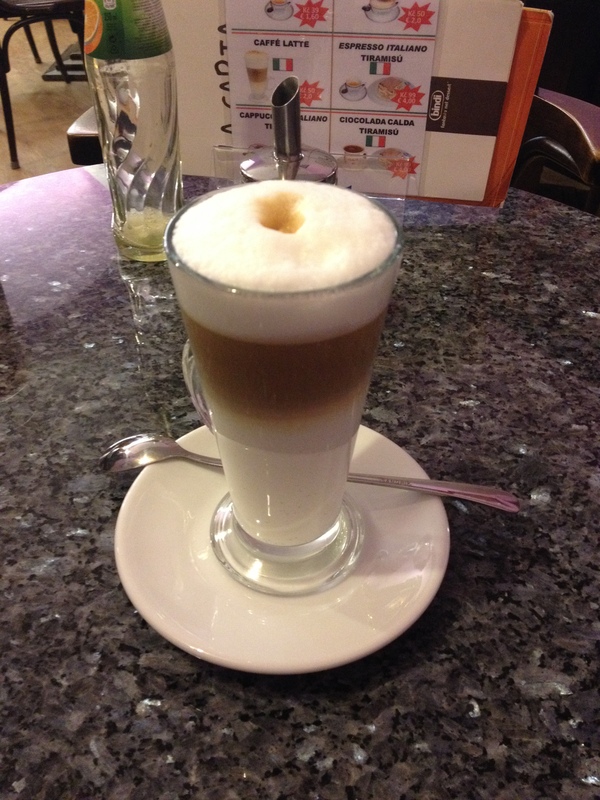 And then grabbed a latte, because I’m a coffee addict, before heading back to the airport. This is the definition of beauty. All in all Prague was amazing and I wish that I’d had more time to go inside each and every synagogue and church. I’m so thankful that I had the courage to break off from the group and go on that tour by myself, because I was able to make two new friends and generally have a much better experience than if I had stayed with the group whose interests differed so much from my own! 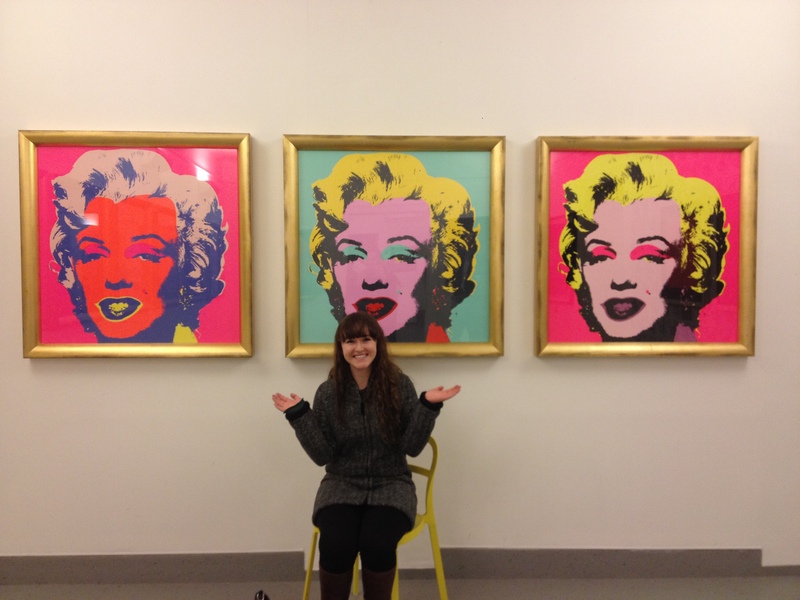 Now I just have a week left in Paris before I visit a friend in Spain and then head home for Christmas break!